RMA architects was founded in 2007, from a studio established by Rahul Mehrotra in 1990 in Mumbai. Simultaneously engaged with a diverse range of projects, the firm sees a multiplicity of experiences as necessary for the evolution of culturally specific design solutions. The practice engages in work that includes projects for governmental and non-governmental agencies, corporate and private individual commissions, to institutional buildings as well as unsolicited projects driven by the firm as advocacy architecture in the city of Mumbai. Organized as a studio, the firm collaborates with consultants and citizens groups for allied building services and urban improvements projects. Currently, Rahul Mehrotra is harvard GSD professor of urban design and planning & chair of the department of urban planning and design. 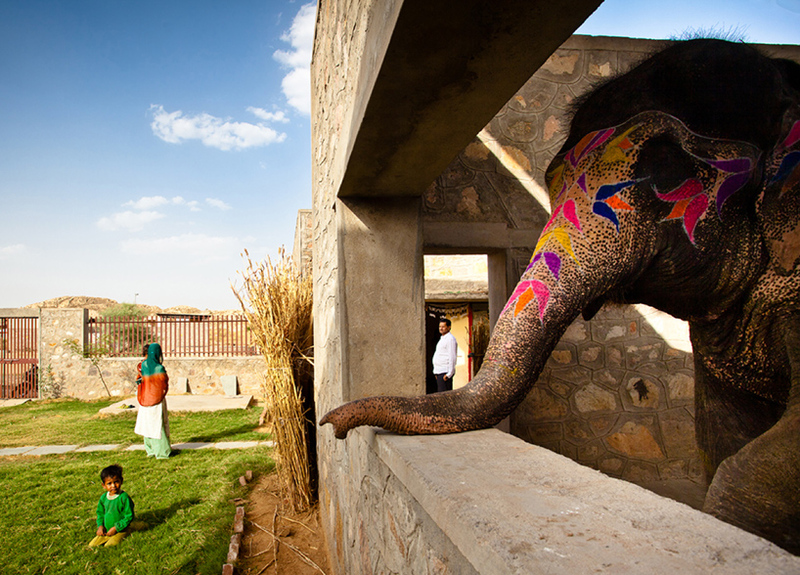 Rahul Mehrotra’s firm, RMA, won a competition organized by the rajasthan government for a housing project for mahouts, the hindi term for elephant riders, as well as their elephants and families and has been recently awarded the gold medal prize for sustainable architecture (organized by the italian university of ferrara). Rahul Mehrotra spoke @WhatDesignCanDoabout his most recent work including the elephant village, or hathigoan. A mahout starts as a boy in the ‘family profession’ when he is assigned an elephant early in its life. They remain bonded to each other through out their lives. 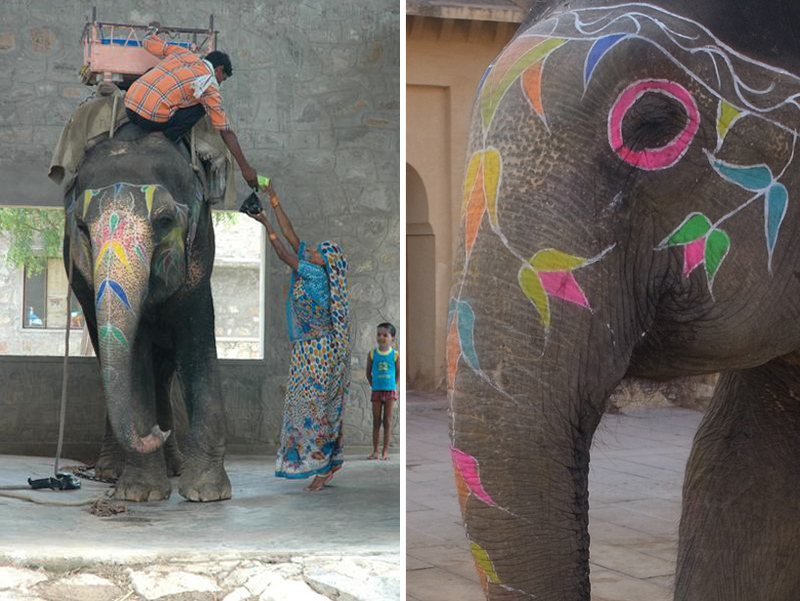 thanks to skill and a cultivated, longstanding relationship, the mahout is the sole person the elephant will obey; however, the keepers are not well paid– their salary totals about 5,000 rupees ($100) per month. The design strategy is based on the need to improve an area devastated by indiscriminate exploitation of sand quarries, capitalising on the potential offered by the artificial orography created by quarrying. the quarries thusly become reservoirs to collect rainwater, an extremely precious resource and fundamental tool for improving the entire region with regard to the environment and microclimate. 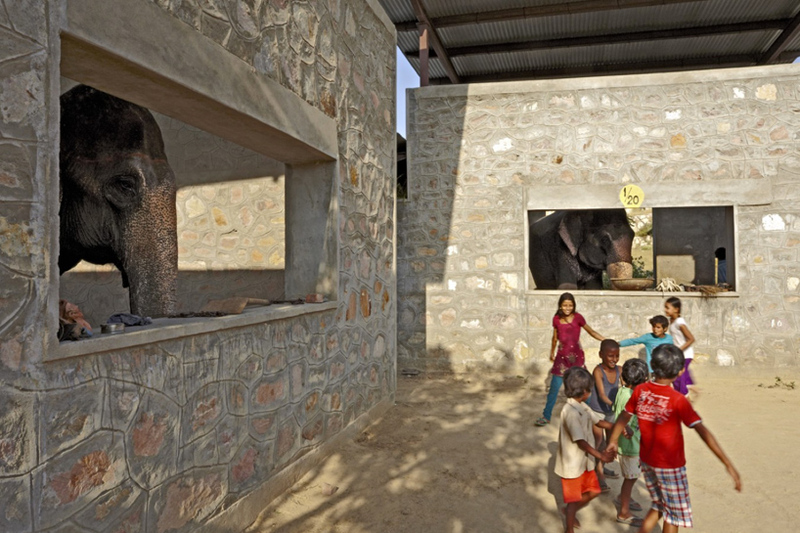 The mahouts’ previous accommodations, in an urban setting without a water source nearby, made for sick and sad elephants. Elephants require 300 litres of water per day; therefore, 100 elephants x 365 days x 300 litres = 10,950,000 litres as of 2013, due to the successful implementation of design strategies, the approximate quantity of water retained on site per year is 20 million litres, approximately double the yearly requirement for one hundred elephants at the hathigaon. 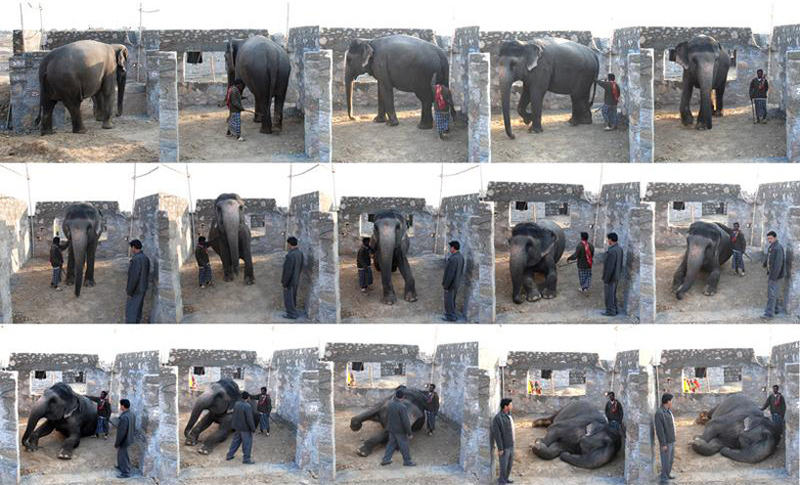 The landscape process required an acute understanding of the history of the site as well as needs of the elephants. 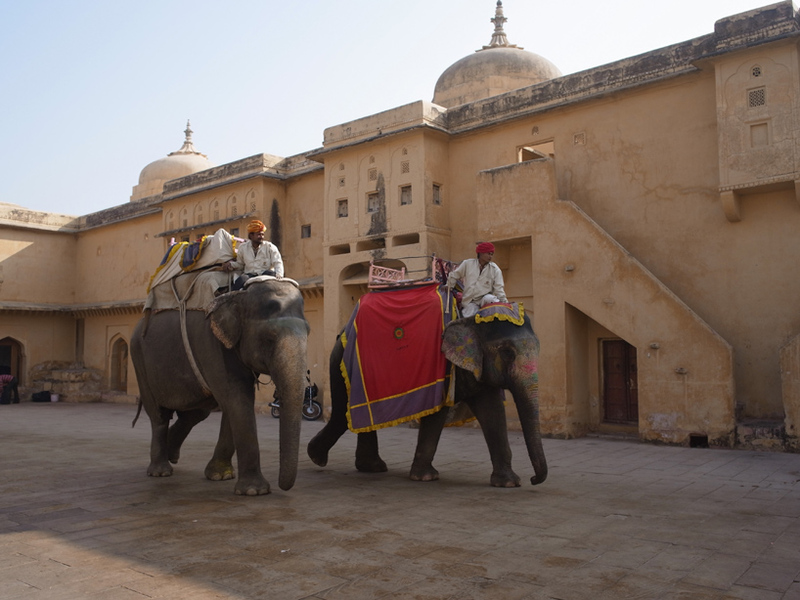 The hathigaon village is situated at the foothill of the amber palace and fort near jaipur. 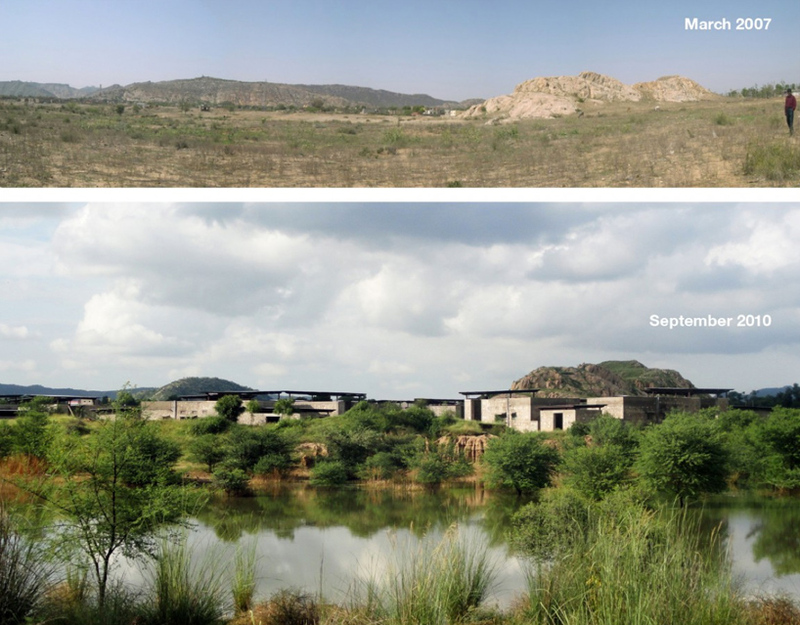 The design first involves structuring the landscape to create a series of water bodies to harvest the rain runoff, as this is the most crucial resource in the desert climate of Rajasthan. With the water resources in place, an extensive tree plantation and seeding program was carried on the site to propagate and stabilize local species. The various water reservoirs are designed to guarantee an adequate monsoon rainwater storage capacity and to cover the water requirements of the new settlement. A number of reservoirs have been designed to provide an ideal place for elephants to bathe, essential for their health and a ritual which reinforces the emotional bond with their mahouts. the resulting water was available to initiate an extensive planting program involving local plant species, fundamental to create a habitat to develop biodiversity and a suitable environment to accommodate the new settlement. The individual housing units are arranged in a number of groups integrated into the redesigned natural areas and are additionally organised around central courtyards which act extensions of essential living space and an important place for socialising. The simultaneous presence of both elephants and humans is resolved with a clear functional division of the respective living spaces, while maintaining a sense of community and genuine sharing of spaces between the animals and their mahouts. 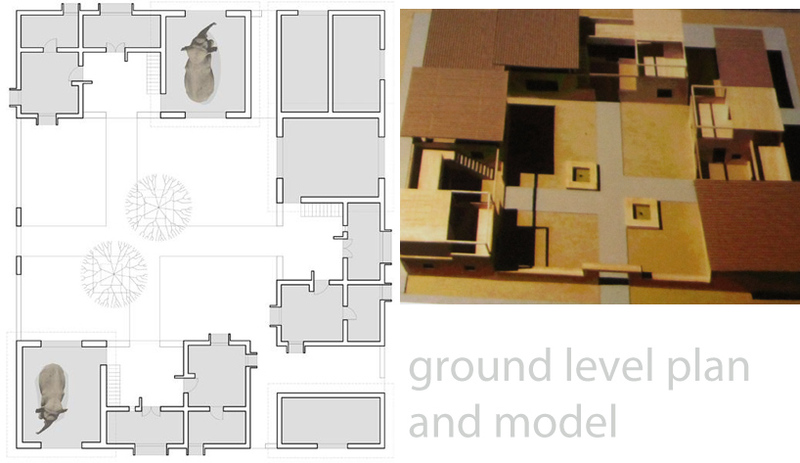 The dwellings are small—200 square feet—and arranged in sets of four, wrapped around communal courtyards. The housing units are organized in clusters and situated on portions of the site that are not used for the landscape regeneration. Courtyards and pavilions supplement the otherwise small spaces that are allocated in the budget for the essentially low-income housing project. Each housing cluster over time is expected to be transformed and appropriated by the users in personalized ways. The courtyard becomes part of the living space. All the houses have electricity and running water. Political factors have stretched the hathigaon project to four years and counting, from the one year specified in the original contract. When the government that initiated the project lost an election, construction was put on hold. Now that the party was elected back into office, it resumed. Mehrotra estimates that in another two to three years, a visitors’ center might be open for business. It can definitely become an interesting tourist spot. Rahul Mehrotra presented this project along with the KMC Corporate office and few others, at the India Design Forum, 2013. With barely 40 minutes to present his selected projects, he could have continued for hours with the audience in rapt attention. He was honored with a standing ovation from the audience. Photographs and information via Design Boom & RMA Architects. Next articlethe out-of-box workstation by planet 3 studios!